Robertson’s Cooked Meat (RCM) medium is used for the cultivation of aerobic, microaerophilic, and anaerobic microorganisms, especially Clostridium species. It is also known as Cooked Meat Broth (CMB) as it contains pieces of fat free minced cooked meat of ox heart and nutrient broth. It supports the growth of both spore-forming and non-spore forming obligate anaerobes and also differentiate between putrefactive and saccharolytic species. Oxygen in culture media can be reduced by various agents such as glucose, thioglycollate, cooked meat pieces, cysteine and ascorbic acid. Thioglycollate broth which contains nutrient broth and 1% thioglycollate is also used to cultivate anerobes. Before inoculation RCM/CMB medium is boiled to make it oxygen free. After inoculation it is covered with a layer of sterile liquid paraffin oil to prevent entry of oxygen in the medium. The ingredients present in the medium help to maintain the anaerobic (reduced) environment. Unsaturated fatty acids present in meat utilize oxygen for auto-oxidation, this reaction is catalysed by haematin in the meat. Glutathione and cysteine (both are reducing agents) present in meat also utilize oxygen. Sulphydryl compounds (present in cysteine) also contribute for a reduced oxidation-reduction potential. Final pH 6.8 +/- 0.3 at 25ºC. Cooked Meat Medium: Meat particles act as a reducing and detoxifying substance, thereby disabling harmful by products that may be produced by the replicating organism. Because reducing substances are more available in denatured protein, the meat particles are cooked before use in the medium. Iron filings: Reducing substance. Iron filings and muscle tissue permits the growth of strict anaerobes. Nutritional supplements: Nutritional requirements needed by most bacteria are provided by peptic digest of animal tissues, yeast extract and dextrose. Hemin and vitamin K are added to enhance the growth of anaerobic microorganisms. Amino acids and other nutrients are also supplied by the muscle protein in the heart tissue granules. Robertson’s cooked meat medium is best prepared from ready to use dehydrated granules available from most suppliers of culture media. Using a small tube or scoop pre-marked to hold 1g of granules, dispense the medium in 1 g amounts in screw-cap bottles or tubes. Add 10 ml of distilled water, mix, and allow to soak for 5 minutes. Sterilize the medium by autoclaving (with caps loosened) at 121°C for 15 minutes. When cool, tighten the bottle caps. Date the medium and give it a batch number. Store the medium in a cool dark place, making sure the bottle cops are tightly screwed. Shelf-life: 2 years providing there is no change in the volume or appearance of the medium to suggest contamination. pH of the medium: This should be within the range pH 7.0-7.4 at room temperature. Depending on the specimen, cooked meat medium is inoculated using a swab, Pasteur pipette, or wire loop. If using a swab this should be inserted to the bottom of the container. For the culture of strict anaerobes, the medium is best used fresh or after being placed (with bottle top loosened) in a container of boiling water for 10-15 minutes to drive off any dissolved oxygen or in water bath at 80°C for 30 minutes to make it oxygen free. Allow the medium to cool to room temperature before inoculating it. The surface of CMB medium may be covered with a layer of sterile liquid paraffin. A saccharolytic reaction is shown by reddening of the meat with a rancid smell due to carbohydrate decomposition. A proteolytic reaction is shown by blacking of the meat with a very unpleasant smells due to protein decomposition. Cultivation of aerobic, microaerophilic, and anaerobic microorganisms, especially Clostridium species. It supports growth of both spore-forming and non-spore forming obligate anaerobes. 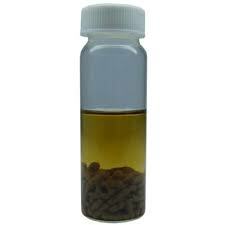 It is useful as an enrichment broth for cultivating organisms from a very small inoculum. Additionally, researchers have found that Cooked Meat Medium preserves viability of organisms over a long period of time and is useful in maintaining anaerobic stock organisms. The Food and Drug Administration recommends its use in the enumeration and identification of Clostridium perfringens from food. how to culture all rumen microbes in cow / elephant dung. Obective being to use efficient natural isolated microbes in biogas / waste decomposing activity.